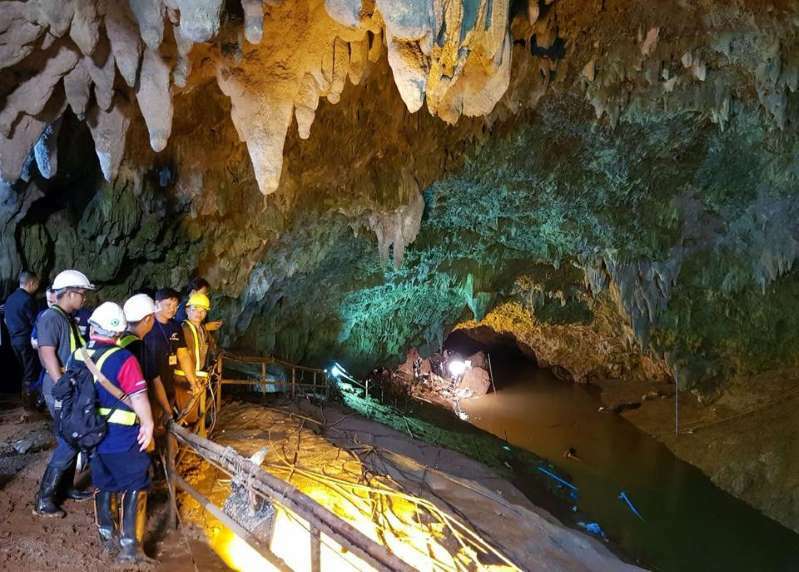 Thai workers and officials at the flooded cave on June 29. The news skyrocketed around the world on Monday: After missing for a week, 12 boys and their soccer coach had been found — alive — after the cave they were exploring became flooded on June 23, officials said. [post_ads]We don’t yet have the full story about how the 12 boys — aged 11 to 16 — and their 25-year-old coach survived in the Tham Luang Nang Non cave. But some national caving rescue experts are weighing in, hypothesizing about how the cave’s conditions could have helped the group. Anmar Mirza, national coordinator of the National Cave Rescue Commission, previously told the Associated Press that the group’s youth and health could help the situation, noting that they should be able to survive four to five days with no water — and a month or more with water but no food. ‘‘The biggest concern is them getting desperate and trying to enter swift moving water,’’ he previously said. The boys were found Monday about 300 to 400 yards past a section of the cave that was on higher ground, which was thought to be where the group may have taken shelter. Tim White, the Southeast regional coordinator for NCRC, said the cave’s relatively warm temperature was probably one of the group’s saving graces: If they were in a US cave, with temperatures that can generally drop below 60 degrees, they could have developed fatal cases of hypothermia. White said cave temperatures, as a rule of thumb, are usually around the average annual temperature for the area they’re located in — which, in the area near the cave, would generally be between 60 and 80 degrees, according to online weather websites. White said that it’s when temperatures drop below 60 degrees that hypothermia becomes a threat. He also said it’s unlikely the cave in Thailand became too warm. “That was probably something they had working in their favor,” he said. The fact that they were surrounded by floodwater also “probably helped sustain them from dehydration,” White said. According to news.com.au, the boys likely had access to freshwater — either dripping in though rocks or rushing in through the entrance — but experts warned that run-off water from nearby farms could carry dangerous chemicals or bacteria. “If they drink the water in the caves and it makes them sick it could hasten the problem that they’re in, but if they don’t drink it then they’re also in trouble,” Mirza told AFP. There also likely wouldn’t be any living creatures native to the cave that the group could catch and eat, White said, so any food they ate would likely have been brought in with them a week ago. “There’s probably nothing there but rock and mud and water,” White said. Anyone thinking of going caving should take the necessary precautions, White said, including attending training sessions, bringing the proper clothing and equipment, and researching the cave’s climate and environment ahead of time. And although officials say the group has been found, there are still challenges for the rescuers to get the boys and their coach out, since high water levels and perilous passageways are still between the two parties. Mirza said the primary decision is whether to try to evacuate the boys and their coach or to supply them in place.